Large gay hotel situated on the beautiful Los Muertos Beach in Puerto Vallarta old town. 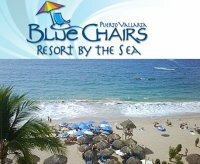 Blue Chairs Resort is located on the beachfront in the "Romantic Zone" of Puerto Vallarta, Jalisco, Mexico, just a few short blocks from the center of town and entertainment. This beachfront resort is a few steps from restaurants, bars, shops and some of the most popular night clubs of Vallarta. When you stay at Blue Chairs, you will be in the heart of the gay zone in a luxuriously renovated resort in an elegant Mexican style. The Blue Chairs Resort, known throughout the world, is incomparable to any other local gay hotel and is the only such lodging in Puerto Vallarta with direct beachfront access and with deluxe services at a reasonable cost. We invite you to come and stay with us, since we are sure you will love it and want to return!